It's time for another challenge over at Createful Heart, #5 this time and, as usual, our theme is Anything Goes. 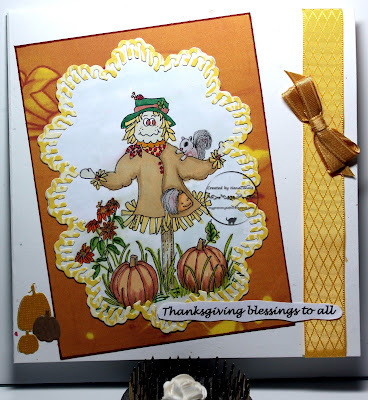 I've used this darling Ms.Scarecrow with Squirrels, which you can find here. She was a dream to color! I colored with a combination of ProMarkers and polychromos pencils, then cut the image with a die from Sue Wilson. The frame is actually an insert cut from a scrap bit of dp, using another die from that same Sue Wilson set. That got mounted onto another scrap from my stash of leftover scrap booking papers. Whenever I am looking for a larger piece, I go search the scrap booking scraps because they tend to be larger, having been larger papers to start. I love the textured golden yellow ribbon and I paired it up a bow I tied using a darker gold ribbon. The pumpkins (die cuts - Impression Obsession) were added to balance off the side with the ribbon embellishment. 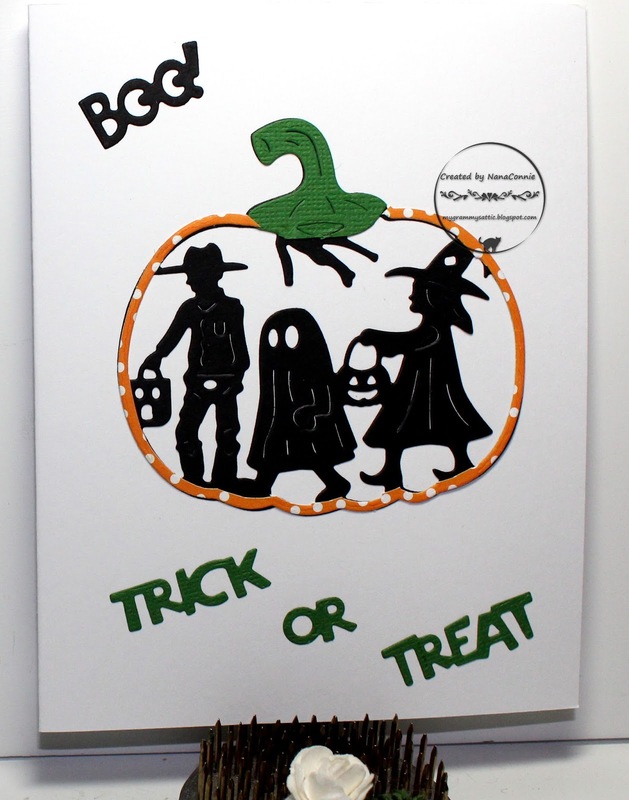 Everybody loves a good Halloween party but have you ever thought about whether witches party on Halloween? What kind of costumes do they wear? Do they put on human people masks? Well, here's a sneak peek into at least 1 witch celebrating. I started with the color combo at Outlawz Color. 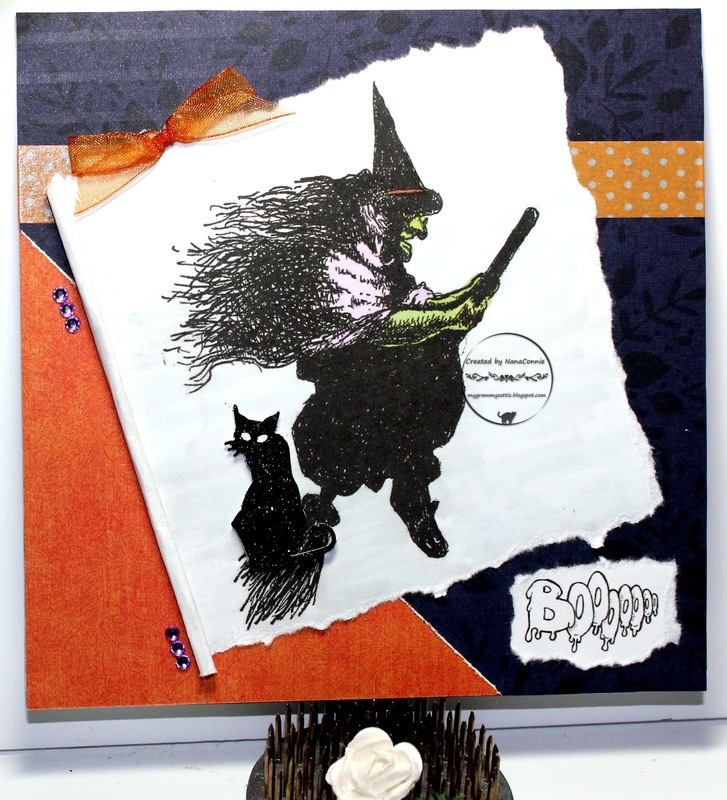 The house is adhered flat onto the card front and the witch is mounted on Pop Dots for some dimension. Two of the bats in the sky have texture because I cut the house three times, took bats from those cuts and added them as layers to two of the bats here. It doesn't show up in the photo, but IRL it's both visible and "feel"-able. I used cool greens and icy blues and colored the image with my ProMarkers. 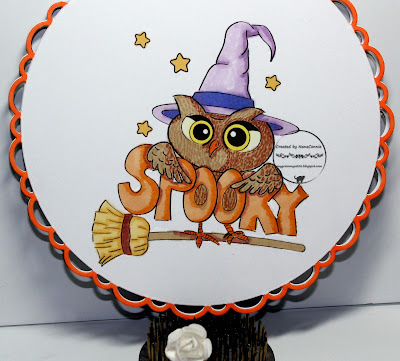 I die cut the image and a frame for it using dies from Spellbinders. 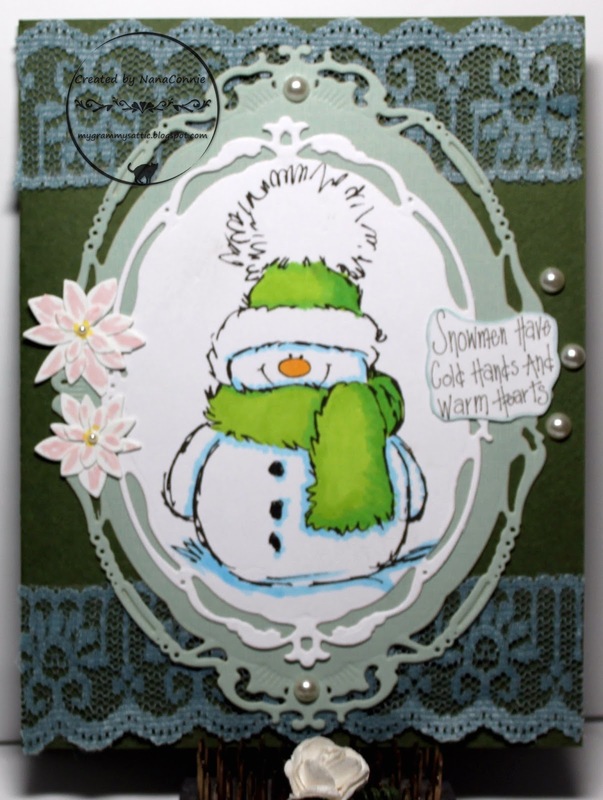 I found a scrap of winter blue lace, cut it in two, and added it to the card front before layering on the image. I made pale pink poinsettias by trimming the flowers off of a flower stem die by Memory Makers and stacking them together. Then I added teeny, tiny pearls to the center of the flowers. To offset those itsy bitsy pearls, I added some large ones to the top and bottom of the frame and along the side, next to the sentiment. I really hope this cools down the weather. 103F in Los Angeles is too hot for any time of year, but is certainly abnormal for late October! 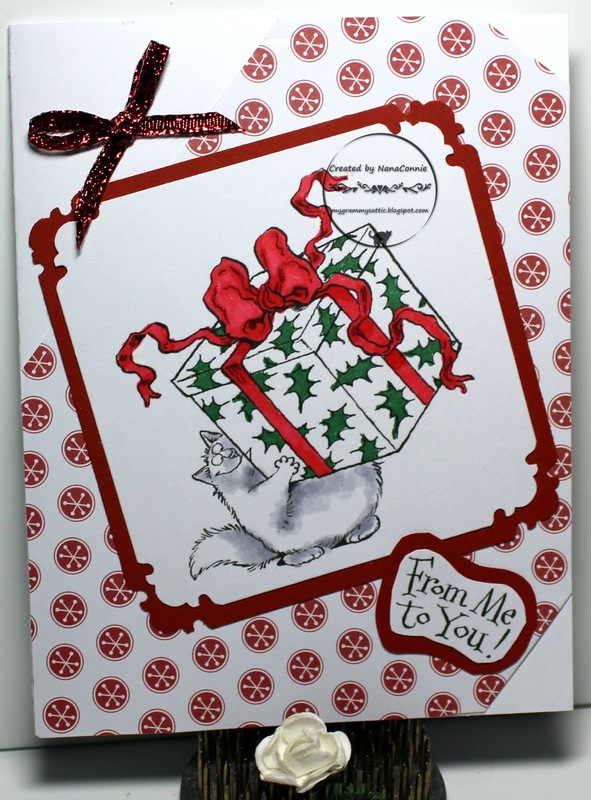 Today I have another card I'm going to post for the Cat Lovers Hop. I wish I could tell you who drew the image but it's one of those I colored probably 2 years ago then tossed in my file of colored-images-ready-to-use and never used it. I actually remember coloring it (which is why I know it's been 2 years) because I was on my holiday travels and I took my colored pencils and gamsol with me plus a few dozen images. I cut the image and the orange frame with simple rectangle dies from Spellbinders. then added a scrap of dp to frame that. The background dp was also a scrap, just big enough to cover a 5 x 5 card. Both ribbons are from my stash of Really Reasonable Ribbon (and I have lots of it.) I tied the bow by hand and, although the photo doesn't do it justice, the ribbon is sparkly beyond imagination but it's brown, not black. I used my ProMarkers to color the image, then cut it with a die from Gina Marie. I printed the sentiment and cut it with a die from Die-namics. 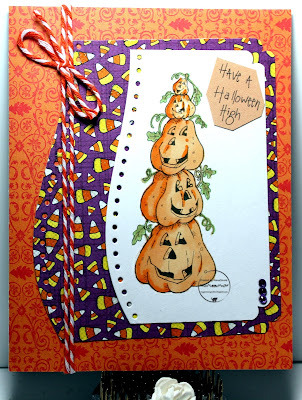 While I was trying to decide what I was going to do design-wise, I ran across some scraps of burlap in my stash which I had originally cut for some fall cards last year. 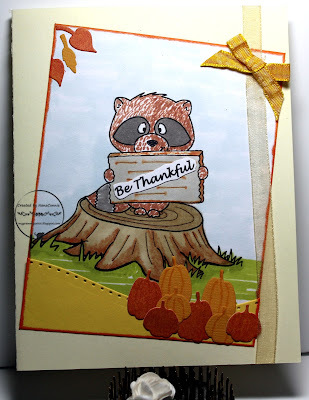 I had scraps in green, beige, red, and dark brown and thought I'd combine the green and brown as background for this card. Since the green scrap was already a wonky shape, I pulled a few more threads from it to accentuate the 'shabby' look, then did the same with the brown scrap, after which I layered them onto each other on the card front. 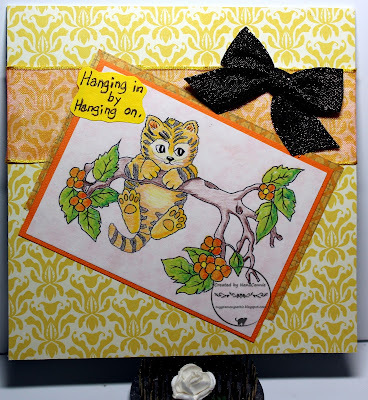 I added the image piece, then some ribbon with spiders and webs, and on top of that, I added the sentiment piece. A hand-tied bow made from sheer orange ribbon (with a black fringed edging) made a perfect embellishment, standing alone for great dimension and texture. Another Halloween card today, showcasing one of my most favorite ever spooky/fun images from QKR Stampede, where we're starting a new "Anything Goes" challenge and this week we don't even have an optional twist. Just Anything Goes! 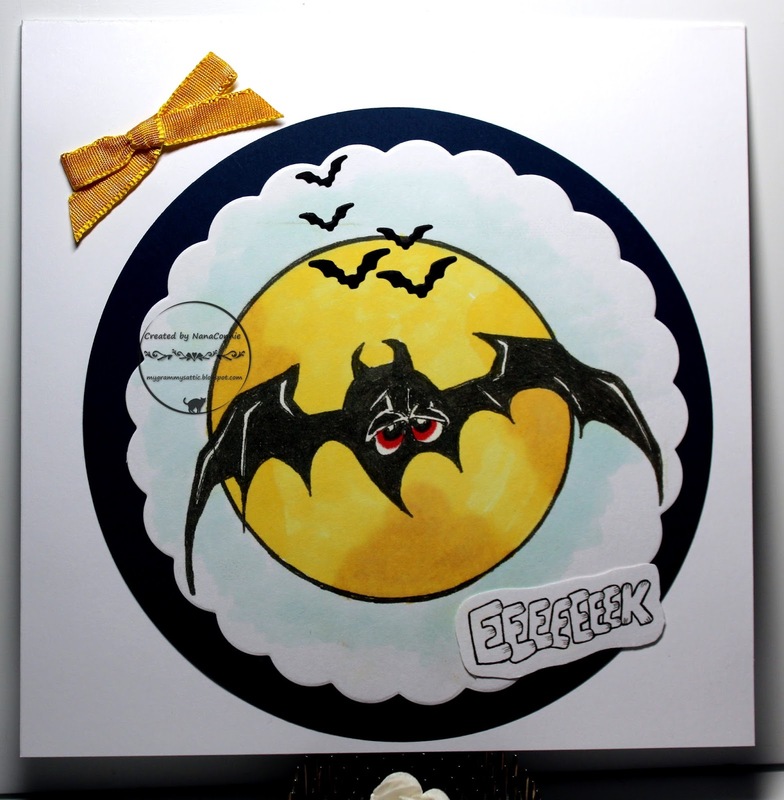 This image is called "Bat and Moon" and the sentiment (can you believe it?) is called "Eeeeek." 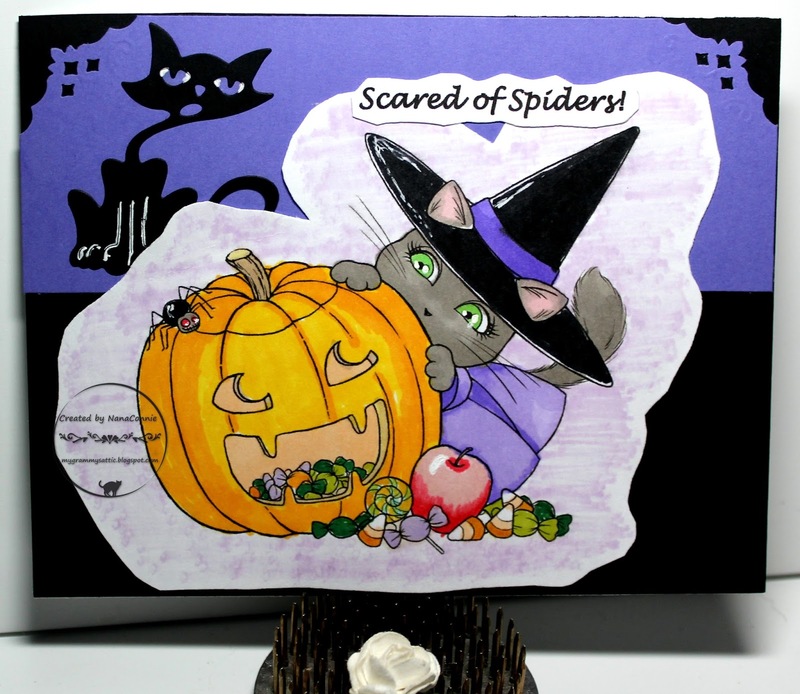 I colored with my ProMarkers and cut the image with a die from Sizzix. 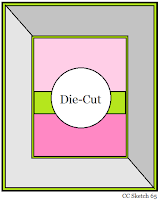 The outer circle is cut with a QuicKutz die. I should tell you that the image is only the bat and moon -- the other little bats are all die cuts (Impression Obsession) which I added to give the image more depth. The sentiment is hand cut and added to the image piece. I embellished it using velvet ribbon tied into a bow. I wanted this one really CAS and I think I accomplished that. Good Morning, all. I hope your week is going well and if it isn't, just think of today as being halfway to the weekend. :-D I'm sharing an owl which is a freebie image for the Progressive Challenge on the FB page over at Limited Runs. I just knew he deserved rich, warm, fall colors so I grabbed my ProMarkers and started coloring. When I finished that, I cut him with a scalloped circle die from Spellbinders and used a die one size larger to make the golden frame. I layered those together, then added Stickles to his eyes and to the eyebrow feathers and tummy. I printed and cut the sentiment, then matted it with a larger die cut (also Spellbinders), echoing the shape of the image. To add just a bit more sparkle, I cut a strip of orange sparkle CS, trimmed the end into a point and added it to the sentiment piece. 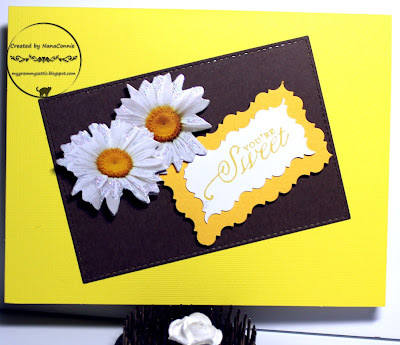 Everything was layered onto a dark brown card base. I thought it needed one last touch so I dug through my ribbon stash and found that lovely gold ribbon, tied it into a bow, and adhered it above the image. Let me tell you a Christmas story. Once Upon a Time there was a baby kitten who was born on a cold, December night and the family promptly dubbed him "Noel" and wrapped him in a Santa cap to keep him warm. For all their good intentions, Noel turned out to be a female but the family kept the name, changing the pronunciation to the more feminine "NoEl" and loved the bright orange fur ball just as much as ever, despite the fact that she pulled ornaments off the tree at every opportunity. Colored with pencils and ProMarkers, then cut with a Gina Marie die. Papers from my Christmas stash and I have no idea how long I've had them but more than 4 years, I guarantee it. 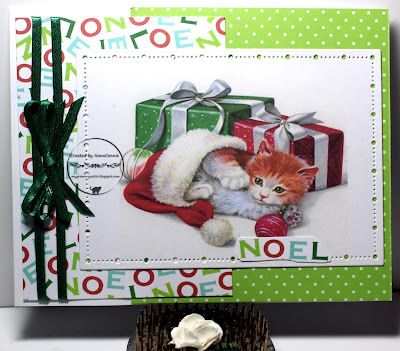 I double wrapped narrow, green ribbon around the Noel paper and tied a double loop bow. 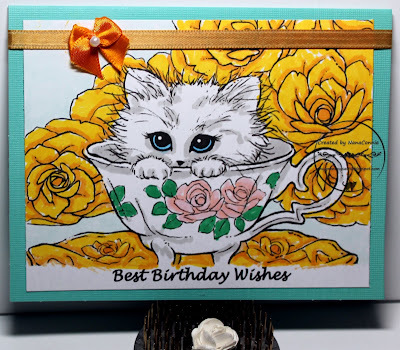 This weekend, I worked a lot with die sets and die cuts and did several really cute but quick cards. Today, I'm sharing two of them. 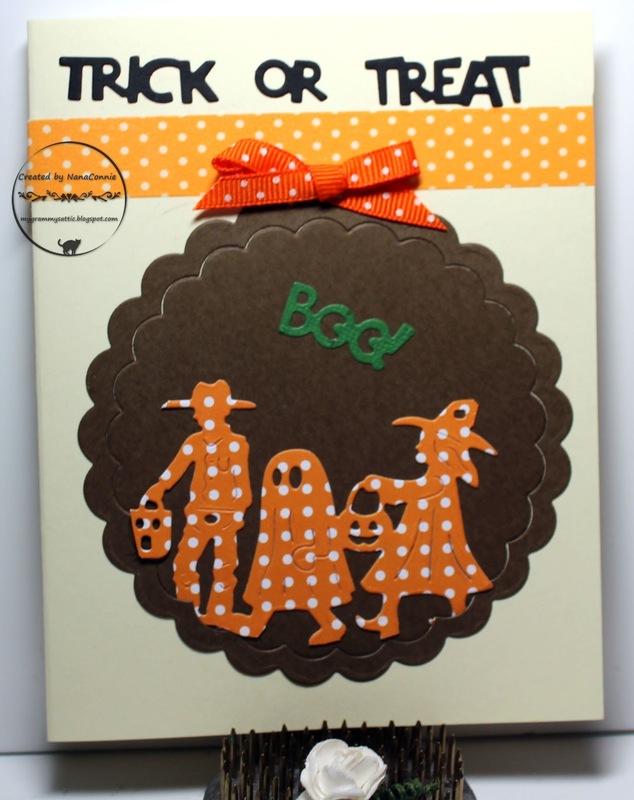 For this first one, I used a die from Cheery Lynn, cut once each on black, green, and orange polka dot card stock. 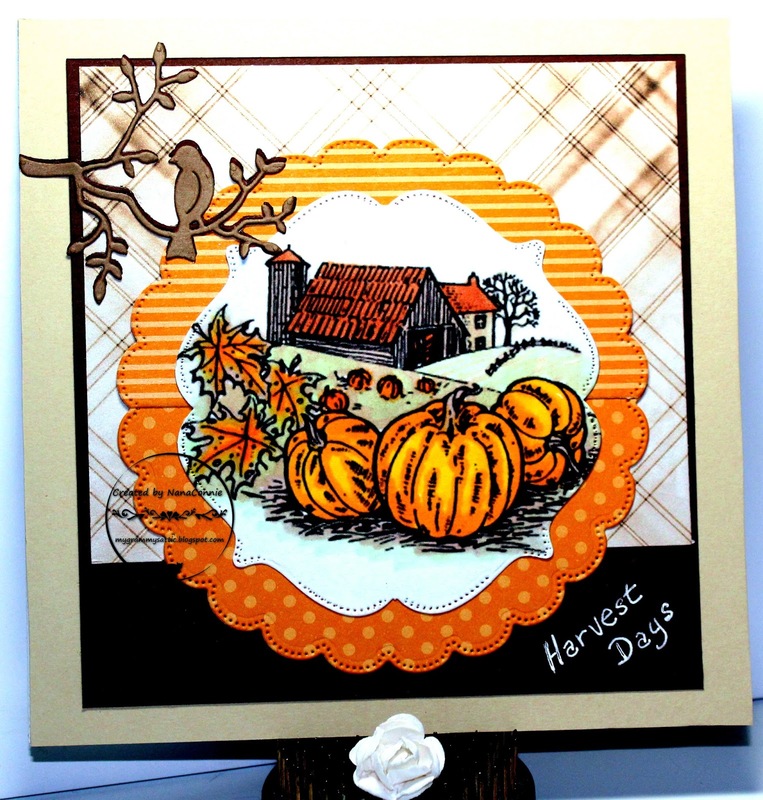 I trimmed off the frame from the orange polka dot die cut and adhered it to the black pumpkin frame. I cut the stem off the green die cut and added it to the top of the black die cut, leaving only the costumed kids in black silhouette. The sentiments are part of that same Cheery Lynn set and I used one cut from the green card stock and the "Boo" cut from black. Everything is mounted onto a white card base and left very simple. 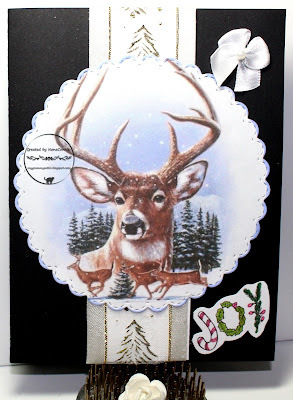 This second card could also be called CAS but it's a bit more complex in design and embellishment. This time, I used the costumed kids which had been left over after I trimmed away the pumpkin shape frame of the orange polka dot die cut. I cut brown card stock with two scalloped dies from Sizzix, inset them, and adhered the kids to the inner die cut. 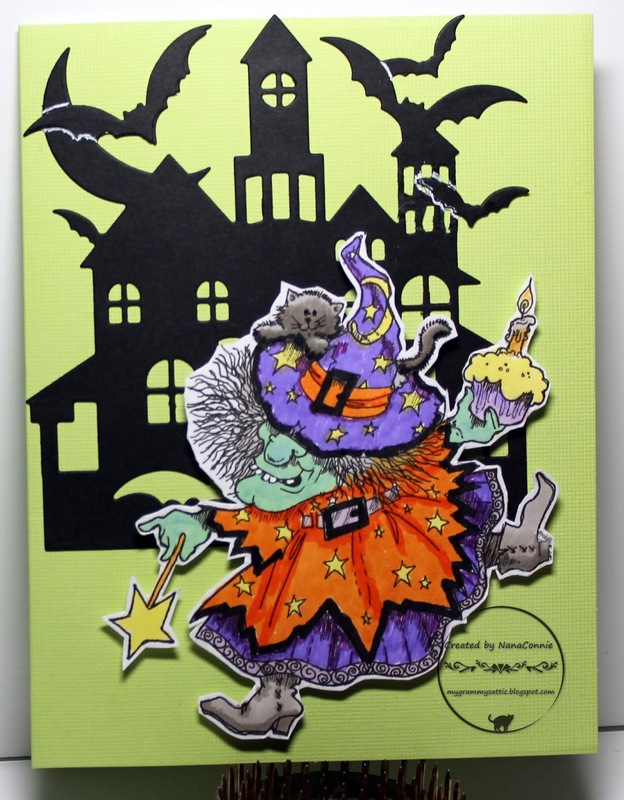 I added a green "Boo" and used the black "Trick or Treat" sentiment at the very top of the card. I found golden polka dot washi tape and bright orange, polka dot, ribbon which I tied into a bow. It's been a long time since I did a card where the focus was on the sentiment rather than a hand colored image and, since I've been hiding out in my craft room most of the day today, I want to share this one with you. It's pretty simple and straight-forward with some texture and dimension. I got an early start on the weekend yesterday when it turned out that we had the afternoon off and, as I promised myself, I'm doing all crafting and no housework for the next two days. I need the wind down and re-energizing time. The first thing I did was to look through my folder of already colored images and I found this gorgeous wolf which hadn't been colored! It just appealed to me so I dug out the polychromos pencils and the ProMarkers and started coloring. Unfortunately, I hadn't put the artist's name on the back of the image so I can't tell you who drew it but I think it's magnificent. If you recognize it, please let me know. I'd love to edit this post and give the artist full credit. I haven't yet decided if it's going to be a Christmas birthday card or just a Christmas card (I have one or two of those among my family and friends) but I definitely gave it a winter feel with the slate and blue CS layers plus the snowflakes. 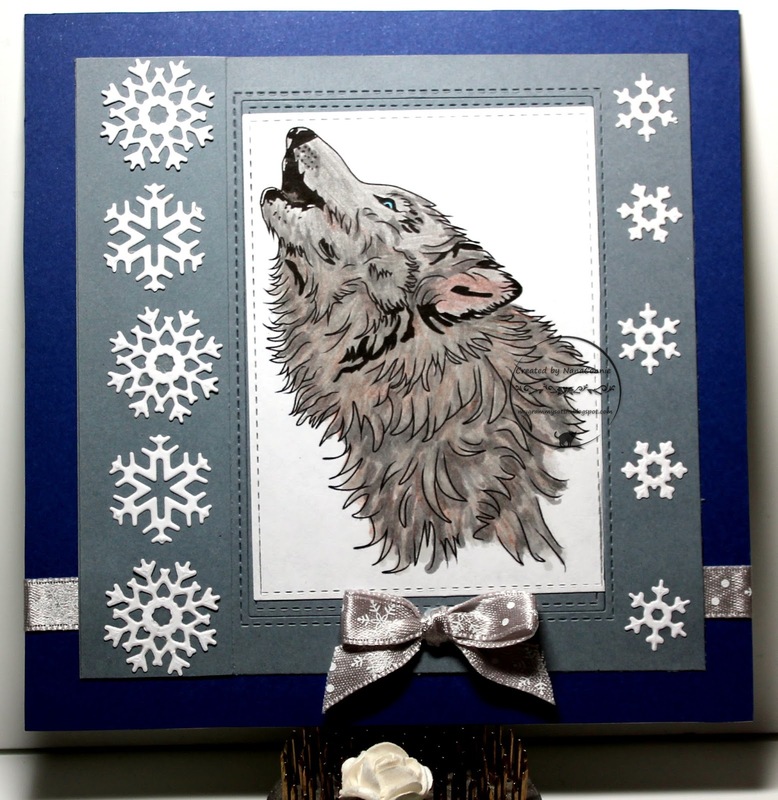 After I finished coloring the wolf, I cut it with a stitched rectangle die from Die-namics. I also cut the slate blue CS with dies from that same set before layering in the wolf. 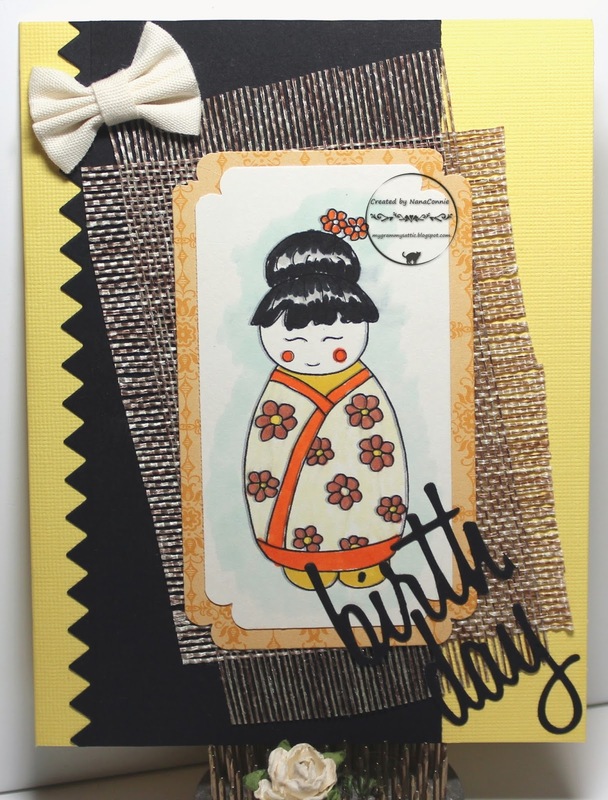 I found deep blue CS for the card front, wrapped it with silver ribbon, and then added the image piece. I die cut the snowflakes with a set from Art Impressions and added them along the borders of the image. Finally, I hand tied a bow using the same silver ribbon. I think this will make a great masculine card. Isn't it usually the one who's shouting the loudest about "I ain't scared" who's actually the most scared? :-D Well, over at QKR Stampede this week, I'm not at all sure who's doing the shouting - the jack-o-lantern or the ghost but I know we have a new challenge starting today with a theme of "Anything Goes" and an optional twist of "Pumpkins" but only if you want to follow it. 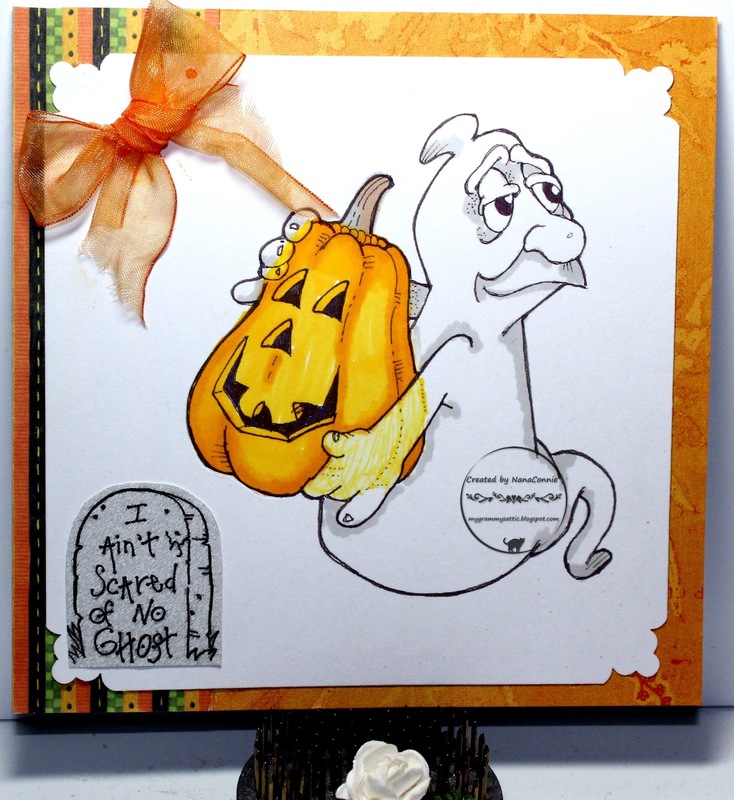 The image and the sentiment are both from QKR; the image is "Carved Pumpkin 17304" and the sentiment is called "Ain't Scared." I did the coloring with ProMarkers, including the shading on the ghost. I wanted him to seem transparent so colored the sections of pumpkin behind his arm and his fingers with a pale shade of yellow instead of shades of orange. I cut the image into a square and punched the corners (Fiskars punch), then added the sentiment piece to the lower corner. I found two scraps bits of dp and used them on the background. The bow is hand tied from a scrap of sheer ribbon and I deliberately frayed the tail ends. I'm so glad the weekend is coming up. I plan to do a bit of laundry and then I'll hide out in my craft room both days. I'm not going to pick up a broom or push the vacuum; I'll use paper plates all weekend and cook only in the microwave with disposable dishes. I need craft time!! The last two weekends, I've done a couple of cards but did mostly housework. This week, I really need the down time to recharge emotionally. I love being on the DT at Createful Hearts and I have been playing in the Progressive Freebie challenge at The Outlawz since it began nearly two and a half years ago so imagine how pleased I was to see one of Mary's fab designs offered as the freebie this month. Don't you just love this old time "General Store" with the dog lazing on the foot-worn porch? I colored with my ProMarkers and cut it with a rectangle die from QuicKutz. I inked the edges to make it stand out from the background. I embossed an orange scrap of CS using a "trees" folder from Darice. The red background CS is distressed along the top edge. 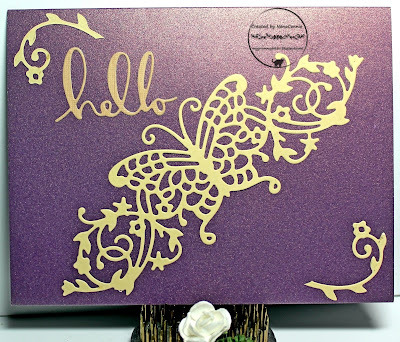 The butterfly was cut with a die from Spellbinders and the little pile of leaves was made with die cuts from Dies R Us. I added a couple of pumpkins to the porch to complement the ones in the image and for those I used a die from Impression Obsession. 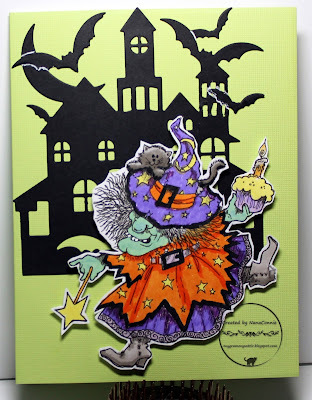 There was so much going on with the die cuts, the embossing, and the bright orange colors that I decided there just didn't need to be any other embellishment so no ribbons or flowers or sparkly gems on this one. Isn't this the most adorable little raccoon ever? 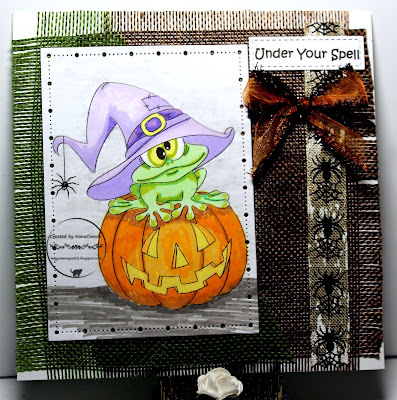 It's for the progressive challenge this month at Gerda Steiner Designs. Because it's already October (where DID this year go? ), I chose a fall color palette and colored the image with my ProMarkers. 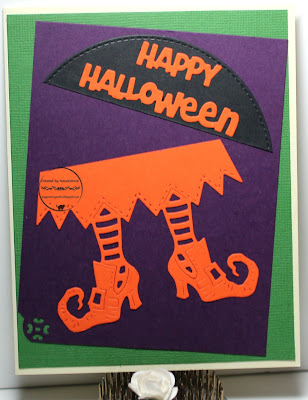 The entire card is made from scraps and bits. The bottom border piece was cut with a die from Spellbinder. 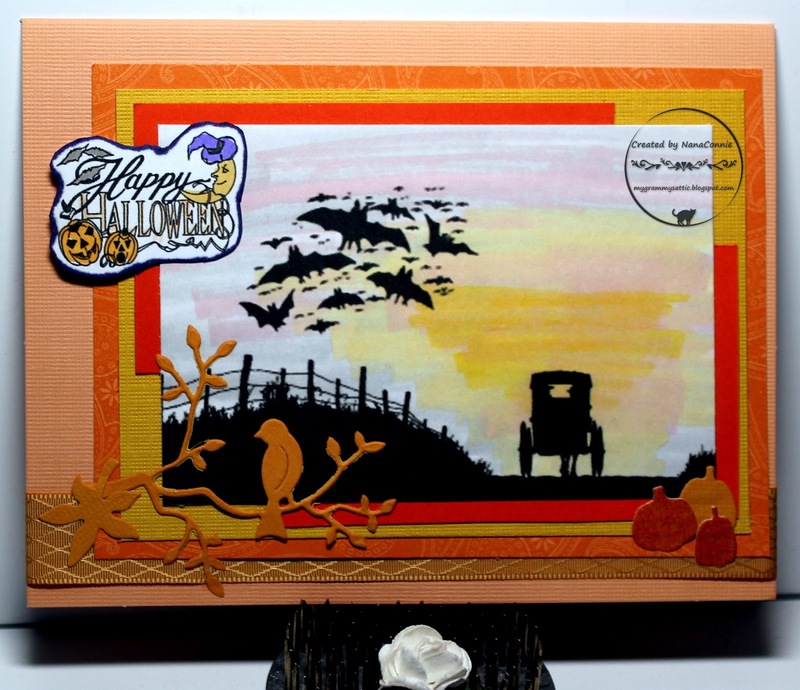 The pumpkin were done with an Impression Obsession die and the leaves are cut with a die from Dies R Us. Both the sheer ribbon and the yellow gingham ribbon were left over bits in my stash. I printed, hand cut, and added the sentiment to the sign, turning this into a Thanksgiving card. 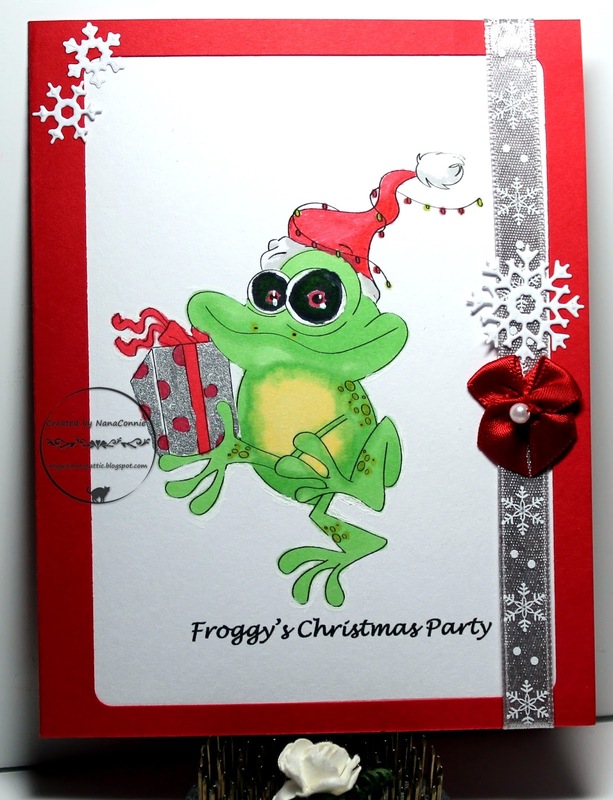 I used my ProMarkers to color the froggy and used a silver paint pen to color the present. The image is cut with an Unbranded die - one of my favorite rectangles because of the rounded corners. I added silver ribbon from my stash and a red bow, then used a set of snowflake dies from Art Impressions to cut the snowflakes. They seemed so perfect with the snowflakes already in the ribbon. A friend and I were crafting together yesterday and I used one of her fall stamps. It turns out she bought it from Victorine Originals and she had a link to their website. Can you believe I've never heard of them before and they even have a challenge! This time they have a beautiful inspiration photo and that's the reason I chose this particular image to stamp and use on my card. Let me show both of them to you and you can tell me what you think. I also used the sketch from Die Cuttin' Divas. I used Copics and colored pencils to color it, then die cut both the image and the frame using dies from Tattered Lace. 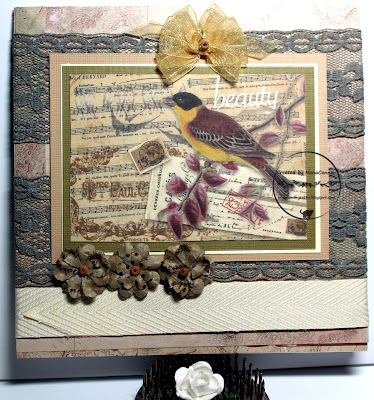 All the papers are from SU and the little Bird on a Branch was cut with a Cottage Cutz die. I've spent most of my crafting time this weekend doing cards for progressive challenges but this one is for the blog challenge at Sasayaki Glitter rather than the progressive challenge on their FB page. He's been printed directly onto the card front and then colored with ProMarkers. I made a shaped card with one of my newest Tattered Lace die sets. It has multiple dies, all for making shaped cards, and all of them round with various lacy edges. This is the largest one of the set and the first one I've used. I colored the scallops with a Bright Orange ProMarker. This is a one layer card and totally without any embellishment other than the scalloped edge. Talk about CAS ! This is the first airbrushed image I've been willing to share. All the rest were practice and simply not worth sharing. This one pleases me enough to share and to even mail to a friend or family member in December. My airbrush is the system from Copics (purchased from a friend who used it gently) and it has taken some getting used to it. I'm still not really pleased with every result because sometimes there's just too much ink and other times not enough but I will probably learn to get consistent results. I did add the snowflakes to the sky and the deer with a white, gel ink, pen, and I added some strokes of it to the white parts of the deer's fur for better definition. The sentiment is from QKR Stampede. The image is cut with a stitched, scalloped die from Memory Box and it's layered onto some white, satin ribbon with gold trim. I decided to use one of my little satin bows and this time, I left it white instead of dying it wait a marker. While I know it's not a common color for Christmas cards, I thought the black card front made everything else pop. We're at the first Friday in October and that means a new challenge over at Emerald City Crafts. This month I used a beautiful bird image from the "Les Beaux Oiseaux" ephemera collection by Linda Simpson Designs. 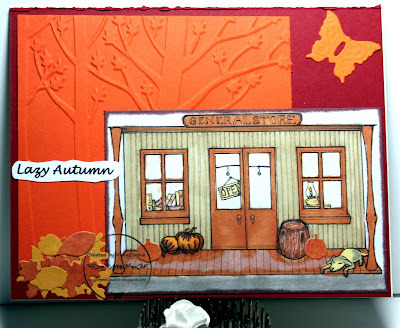 I love all the images in this particular collection (see at the bottom) but this one seemed so perfect for an autumn card. I also decided that this image called for a shabby chic card with lots of layers and plenty of laces, ribbons, and paper flowers for embellishment. There are several layers to the image piece, then a twill ribbon, plus strips of gray lace all laid on top of a delightful vintage paper. The multi-loop bow was made on my bow maker and I added a wooden bead to it, matching the ones in the centers of the paper flowers. I really love the final look of this card! 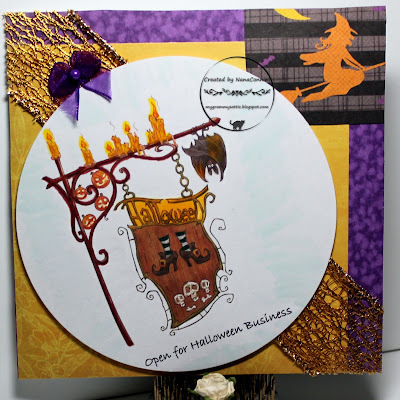 OK, now that I know that song is running firmly through your mind and will for the rest of the day, I want to share with you two versions of a card I did using my newest Cheery Lynn Halloween dies, including the sentiment which I did my best to feature on each card. Everything on both cards was cut from leftover snippets of CS. 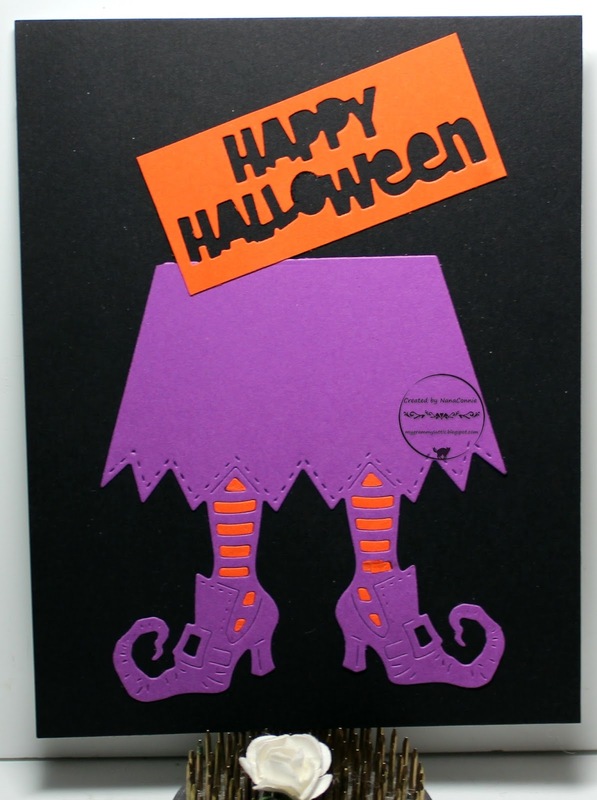 This is the card with a black background and the main part of the witch cut from purple CS with orange inlays. 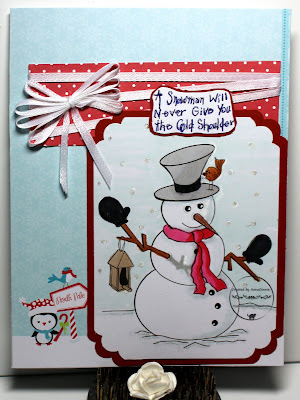 The sentiment (Cheery Lynn) is the negative part of the die cut trimmed into a rectangle with a die from QuicKutz. My second card uses the same witch die but I cut off the top part of the skirt and cut that piece from orange CS, layered onto purple background which had one corner punched with a Fiskar's punch. This time the background just shows through the stockings; no inlay done. For the sentiment, I used the cut outs from the previous card's sentiment and layered those onto a stitch circle die cut (Die-namics) which I trimmed to fit the upper part of this card. Everything was put onto green card CS and that was added to a white card blank.